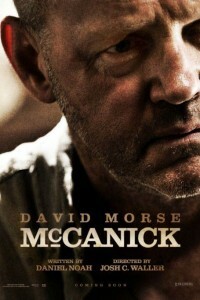 Watch the McCanick trailer below, starring Cory Monteith. The movie McCanick, the final movie featuring the late Cory Monteith, makes its world premiere at the 2013 Toronto Film Festival. And arrives in theaters everywhere in 2014. When narcotics detective Eugene “Mack” McCanick (David Morse) discovers that a seemingly harmless young criminal, Simon Weeks (Cory Monteith), has been released from prison, it triggers a firestorm of paranoia and violence. Unbeknownst to the chief of police (Ciaran Hinds), Mack and his partner, Floyd (Mike Vogel) mercilessly hunt down Weeks for unknown reasons over the course of one long, hot day. The closer Mack gets to his prey, the more we understand that his frenzy stems from a truth from the past, which only Weeks can expose.